2 Bedroom Flat For Sale in London for Asking Price £535,000. A stunning boutique development of 4 individually crafted apartments. Previously a rubber factory, the building has historical references throughout which have been accentuated by dark charcoal painted wood flooring which offer a stark contrast to the clinical white walls. The clean lines create a feeling of continuity, drawing the viewer in. The building has been brought to practical modern standards while combined with the original Victorian charm. Generally blending contemporary with few vintage references and retained features where possible. Well-proportioned and well thought out apartments along with artistic styling have created unique spaces for the modern day buyer. This 2 bedroom apartment is located on a lower ground floor of the building and offers added benefit of a private patio accessible from both of the bedrooms. Images are of a show apartment. The property is well located for the amenities of both Clapham Old Town and Clapham High Street. Local transport links include Clapham Common Underground Station (Northern Line) and Wandsworth Road Overground Station, part of the London Overground orbital train network. These, along with excellent local bus services and local Boris bike docking station provide quick and easy access into Clapham Junction, the City, the West End and the King's Road. The property is also well located for access to Battersea Park and the exciting Battersea Power Station/Nine Elms development, with a new Zone 1 tube station due for completion in 2019/2020. Situated in the heart of one of London’s key regeneration areas, offering excellent inward investment to make Wandsworth a genuine destination. 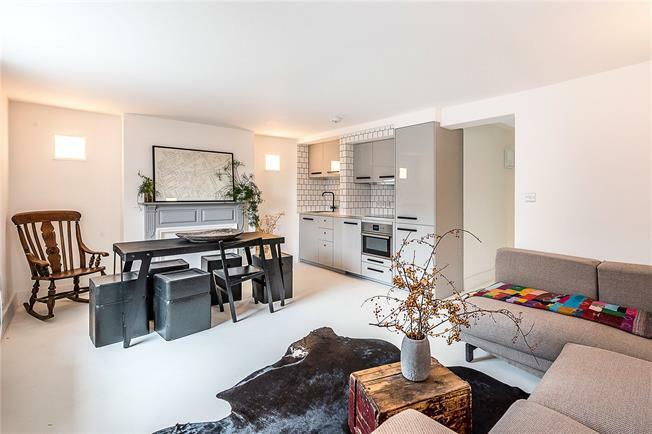 The property is superbly linked with Clapham Common a short walk away with the Old Town and its boutique bars and restaurants. Clapham Old Town has long been one of the most sought-after locations south of the river, home to some of the most highly desirable residential streets with an SW postcode. With an eclectic range of beautiful Victorian gastro pubs and contemporary cocktail bars within strolling distance, development is conveniently located close to the beautiful open spaces of Clapham Common, providing 220 acres of tree lined grassland, with a catalogue of lively events throughout the summer months. The area boasts a mix of architecture from Georgian and early Victorian dating back to Queen Anne. The heart of Clapham Old Town has become well known for its superb range of eateries and restaurants with an extensive choice of cuisines from a gourmet.